Tomorrow is free pancake day! 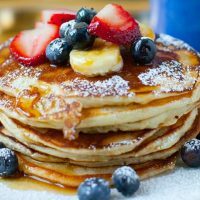 Tuesday, March 12th is free pancake day at IHOP! The full name of this glorious day is: “Free Pancake Day – Flip it Forward For Kids”. IHOP is offering one free short stack of pancakes per customer. Check your local IHOP because some locations are offering these free cakes up until 10PM while others are offering them from 7am – 7pm. This day supports the Shriners Hospitals for Children, Children’s Miracle Network Hospitals, and The Leukemia & Lymphoma Society. Although the pancakes are free guests will have the opportunity to give donations while dining to the charities.